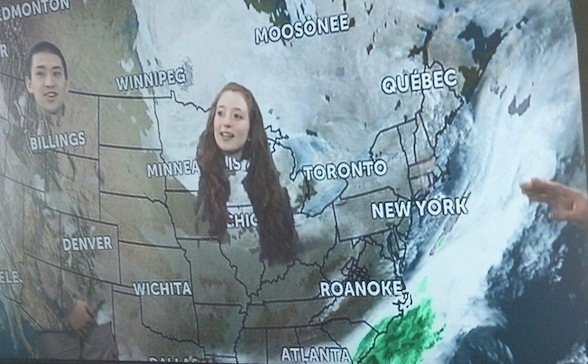 On Wednesday, February 26th, the forecast predicted 38˚F, rainy, and gloomy…that it was, but there was no need to be glum and melancholy because my Physics class went on a high school field trip to our local news station to ask the meteorologist some questions that had come up in class. Some of the questions had to do with the Doppler radar, mechanisms for collecting data, prediction of the weather, and high pressure/low pressure. The local news station is called WSLS 10; we met with the chief meteorologist, Jeff Haniewich. I’ve been a fan of his for years, so meeting him was an experience of its own. I was delighted how personable and welcoming he was to us. He managed to answer all of our questions. I found a lot of things interesting that he was saying, one of which was that the weather balloons travel almost into outer space while collecting all their information before they pop! Another thing that I found interesting was that the area around here in Virginia is in the top 10 hardest places to forecast because of the varied topography–mountains, New River Valley, lowlands, and highlands. Mr. Haniewich also gave us lengthy instructions on how to navigate the weather website that he uses to gather his information, which is www.weather.gov. NOT weather.com. He made that very clear to us. 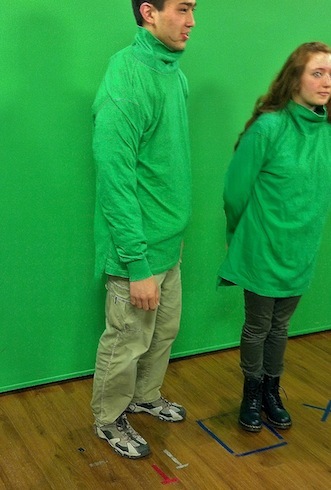 This is how it is done green shirts on green screen. One of the things I found most fun was the “green screen” which is where any meteorologist stands while giving the forecast, and that is where, on our TV, the map is projected behind him. My classmate and I were given special oversized turtlenecks to wear, and once we put them on we just looked like floating heads and hands on the camera. The best thing of all, in my opinion, was that he delivered a really good message, which was to be sure you love what you’re doing because you’ll be doing it a good deal. He is so inspiring because of how dedicated he is to his job. He told us that when we had the big snowstorm in mid-February, he stayed at work for 52 hours straight… there’s some devotedness for you. This was definitely one of the best field trips I have been on, and I can’t wait to go back!